*The shoes are slightly dirty. 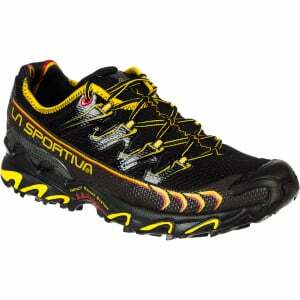 Ultra sticky rubber gives the sole of the La Sportiva Men's Ultra Raptor Trail Running Shoe grip where other trail runners slip. Race along roads, pick through rock gardens, and pound down steep descents without worry. Dynamic midsole cushioning reduces the impact of every foot strike, a rigid toecap guards your toes against rocks, and the unique Impact Brake System uses angled sole-lugs to reduce stress on your joints when you're running up or down a steep slope. Go the distance with this neutral, stable trail shoe.